Plenty of vendors claim they capture data from sources all over the internet. No other vendor captures data as deeply and completely and delivers it you as quickly as Cold Creek. Comprehensive, granular marketing data comes from varied sources. Some sources log vague information about your customers, and some are far more detailed. Other sites gather data once per day while others gather hourly. We capture data from all these sources and methods to give you a more complete picture of your campaigns. We integrate with various ad servers so you can access all the detailed data on how frequently your ads are shown, who saw them, how many times they saw them, and how they reacted. We interface with Mobile SDK’s to help you capture the on-the-go activity of your ideal customers. Metis helps you gain insight from all the data of the huge and growing mobile audience. We collect data from all the common DMP’s you probably already use. If you have a favorite advertising data storehouse that that isn’t on our list, just ask and we’ll happily add it. Granular data about user’s activity yesterday affects your decisions for tomorrow. 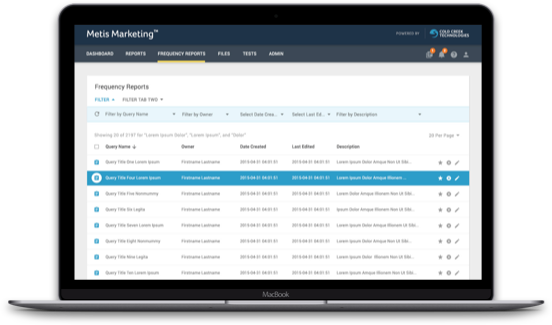 To help you plan marketing projects and product launches, Metis serves up the most complete transaction data. Segment audiences, learn purchase habits, and ultimately create better retargeting campaigns with our tools. Cold Creek’s propriety pixel delivers the direct user data you crave. It is not enough to simply post an advertisement on a website and hope it leads to action. We integrate data from viewability vendors so you always know if users see the ads you buy. Drive your campaigns and keep them budget-friendly with the most complete profiling and contextualization information provided by Metis. We integrate data from your RTB bidder so you always know if your marketing dollars are well spent. We help you compile all the granular data from the biggest social networks, the smaller specialized networks, and your paid search campaigns. We integrate data from all the major search and social players in the space.